Been busy and haven't updated this as I should. I've got projects going and coming. 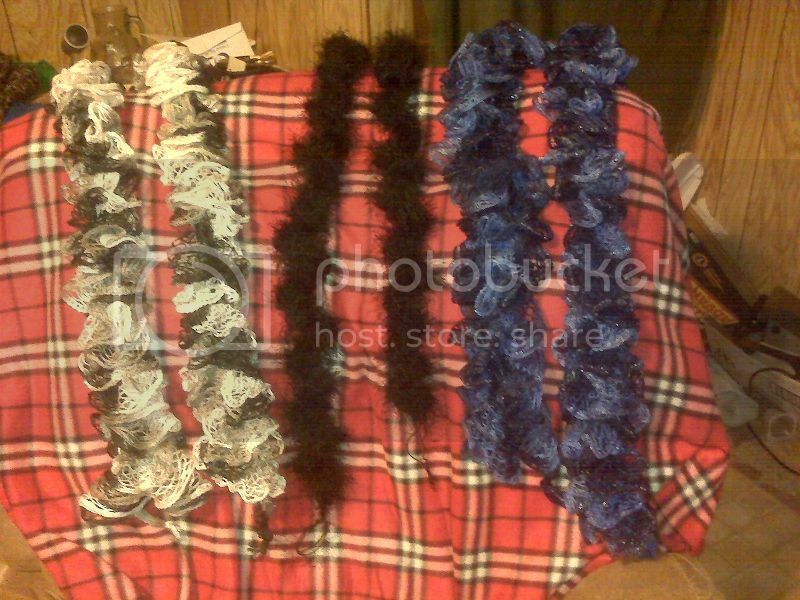 I learned how to make those ruffly scarves that are so popular and now I'm starting to get orders for them. Working on getting my original patterns updated and in pdf format to add to my Ravelry so they'll be more accessible to those who would like to use them. I also have an order for a personalized filet crochet mat. You know, one of those things that has your last name crocheted into it? I've just finished charting it and now I need to figure my starting chain and get some thread so I can get started on it. I'll get some pictures up when I get more time. Maybe I should just go into the scarf business. I finished the two scarves and made a third one. The third one is a twisty one made from fun fur and matching #3 crochet thread. All three are sold. Two to a lady from my church (who ordered them) and the other to someone who saw the picture and liked the twisty one. It'll go in the mail tomorrow, btw. If this keeps up, I might make a business crocheting small things, I've never had the patience for big things. But scarves/accessories? No problem. I am doing another lady a favor though. She brought me a damaged doily to see if I can repair it. It's old and holds sentimental value to her because she knew the person who made it. Sadly, it can't be repaired, but I may be able to recreate it. As a matter of fact, I don't think I'd be able to repair it even if it could be since the person who crocheted it is left handed and I'm right handed. How do I know this? The rounds on the doily are going clockwise instead of counter clockwise. I've begun reconstruction of the pattern. It'll be a lot of trial and error and counting, but I think I can do it. I'm using some baby yarn and a small hook to recreate it, writing down what I've done so I can then recreate it in thread. Also, I noted that there is a mistake in the original one, in one of the pineapples, that I have corrected in my version. Only another crocheter would even have seen the mistake and the crocheter simply compensated for it rather than rip it back and correct it (something every crocheter is guilty of, including me). Anyway, wish me luck. I've had a few stumbles in interpreting it, but I'm getting there. I will post more pictures as the work progresses. This is a lot more than a weekend project, but it's coming along nicely. I have about fourteen rounds deciphered, which brings the pineapples to a close and then I can figure out how to do the cluster rounds and the lacy rounds. They shouldn't be as hard to decipher as the previous rounds and when I'm done I'll have a pretty doily and a pattern to recreate the original from white thread. It doesn't look like a lot, but it's not stretched and blocked since it's unfinished. I'll be blocking it once I finish. On another note, my thread came in for the other thread project I have to do-a filet name graph for another friend. I had to order the thread because I can't get out of town to any hobby places and my local w-m only has #30 thread in white and she didn't want white. I ordered four balls of cream and it arrived today. Now I just need for my hook I ordered on ebay to arrive. W-M didn't have any #12 steel hooks in their store or online. Some of those projects are still on the go, some will probably get frogged and used for other things. On the bright side, I'm getting better at finishing a whole pair of socks. I've made some more in that same tadpole pattern and I'm working on a pair that I just made up in my head, a twisted rib pattern that looks really nice in the finished sock. I just started its mate. And my granddaughter has asked for a pair of yellow socks, so I'm making her a pair (both socks at the same time) using another pattern that's in my head. Almost up to the heel on them. And here's a picture of the latest sock I've finished. I finished it while waiting for my husband to come back to the room from his catherization yesterday. The other one is on the needles, I'm still working on the toe and they're toe-up socks. I have been on a bread making kick the last week or so. I've now replenished my bread flour, supplemented with some whole wheat and some all-purpose flour. I've now gotten started on some sweet dough, found the recipe on Paula Deen's site and I adapted it to work in my bread maker. In about half an hour I'll be rolling it out and making cinnamon rolls with it. They'll proof in the fridge overnight and I'll bake them in the morning for breakfast. Which recipe are you using? I used this doughnut recipe and adapted it to mix in my bread maker (which really necessitated using the equivalent of warm water and dry milk for the warm milk), so all I had to do was roll it out and put butter and cinnamon on it and roll it back up. I now have a loaf of honey wheat bread going in the bread maker. The recipe is in an old book I got when I first got a bread maker, called Electric Bread. It's a wonderful recipe for honey wheat bread. It uses mostly bread flour with a half cup of whole wheat flour. I like it better than 100% whole wheat and so does the husband. I'll be up late waiting for it, but since he's out working tonight, that isn't a problem. The cinnamon rolls turned out scrumptious! I didn't get any pics of them in the raw state, but I did get some while they were frying, and after icing. My breadmaker did all the work, all I had to do was put the ingredients in and turn it on the dough cycle. An hour and fifty minutes later I was rolling it out, putting on soft margarine, cinnamon and sugar, rolled it up, cut it in slices and placed in pans which I covered with foil and placed in the fridge overnight. Then this morning I got out my biggest iron skillet and heated it on the stove, put in a mixture of vegetable oil and shortening, then waited till that got hot. Tested with one of the end pieces and it started going immediately, so I dropped them in a few at a time so they would have room to expand. While the pan was heating, I mixed up powdered sugar, butter and milk for the icing. It flowed, but I could still spread it with a knife. Once the rolls drained on a rack for a bit, I put them back in the pans and iced them, and covered them. They'll still be good reheated, hopefully. I got the two end pieces and another small one after icing, so they are yummy! Oh, the honey wheat bread turned out great. I got it out of the pan and let it cool for about five minutes and then put it in a large plastic ziplock bag. This morning the crust is nice and soft and my new bread knife sliced through it easily. I have a guide I can put the loaf in to get even slices, so it turned out beautifully. I love the new knife, it doesn't 'grab' the bread when I use it and tear it up, it goes through like hot butter. I got it at our restaurant/pool/welding supply place, so it's commercial grade and only cost me about $20. I think I'll go back sometime when I get some more money and invest in a good donut cutter. Little girl, you don't play fair!!!!!!!! You did warn me, but that didn't mean I could control the level of drool! Um, where's the butter? And this time I put on my drool bib! Next up (when I'm feeling better) will probably be some potato bread.